Drawing of the L1 spacecraft at the Kaluga Museum. Note the hatch clearly shown in the side of the re-entry capsule and the very large inverted cone at the top - much larger than shown in other drawings. Is this a 'posadka' L1? Planned second Soviet circumlunar flight. Cancelled after the success of the American Apollo 8. Launched: 1969 May. Number crew: 2 . On 24 September 1968 Bykovsky/Rukavishnikov were the prime candidates for the first Soviet circumlunar flight. When the crews were named, they had been bumped to the second flight. More at: Soyuz 7K-L1 mission 2. People: Rukavishnikov, Bykovsky, Klimuk. Projects: Lunar L1. Soyuz crews - . Nation: Russia. Related Persons: Artyukhin, Beregovoi, Bykovsky, Demin, Feoktistov, Gagarin, Katys, Komarov, Korolev, Nikolayev, Volynov. 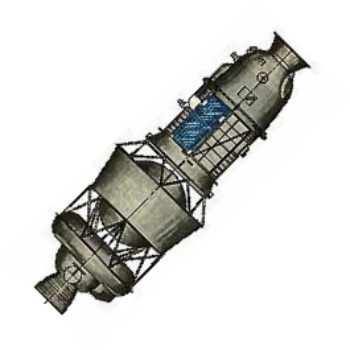 Program: Voskhod, Soyuz, Lunar L1. Flight: Soyuz 1, Soyuz 2A, Soyuz 7K-L1 mission 1, Soyuz 7K-L1 mission 2, Soyuz s/n 3/4. Spacecraft: Soyuz 7K-L1, Voskhod. Kamanin calls Korolev, finds he is suffering from very low blood pressure (100/60). Kamanin suggests that candidates for the commander position in the first two Soyuz missions would be Gagarin, Nikolayev, Bykovsky, or Komarov. Korolev agrees basically, but says that he sees Bykovsky and Nikolayev as candidates for the first manned lunar flyby shots. Kamanin suggests Artyukhin and Demin for the engineer-cosmonaut role on the first Soyuz flights, but Korolev disagrees, saying Feoktistov has to be aboard. However Korolev agrees with Kamanin's selection for the next Voskhod flight - Volynov/Katys as prime crew, Beregovoi/Demin as backups. Later Kamanin corresponds with Stroev over modification of an Mi-4 helicopter as a lunar lander simulator. 1966 December 7 - . Soyuz and L1 crew assignments. - . Nation: Russia. Related Persons: Beregovoi, Bykovsky, Gagarin, Gorbatko, Grechko, Kerimov, Khrunov, Komarov, Kubasov, Leonov, Makarov, Mishin, Nikolayev, Rudenko, Shatalov, Volkov, Volynov, Yeliseyev, Yershov. Program: Soyuz. Flight: Soyuz 1, Soyuz 2A, Soyuz 7K-L1 mission 1, Soyuz 7K-L1 mission 2, Soyuz 7K-L1 mission 3, Soyuz s/n 3/4, Soyuz s/n 5/6, Soyuz s/n 7. Spacecraft: Soyuz 7K-L1, Soyuz 7K-OK.
Rudenko, Mishin, Kerimov and Kamanin agree on crews for upcoming flights. Komarov, Bykovsky, Khrunov, and Yeliseyev are assigned to Soyuz s/n 3 and 4; Gagarin, Nikolayev, Gorbatko, and Kubasov to Soyuz s/n 5 and 6, with Beregovoi, Shatalov, Volkov, and Makarov trained as back-ups. For Soyuz s/n 7, which will conduct space welding experiments with the Vulkan furnace, the commander will be either Komarov, Bykovsky, Gagarin, Nikolayev, Beregovoi, or Shatalov. The other two crewmembers will be either Lankin and Fartushniy from the Paton Institute, VVS cosmonaut Kolodin, or an engineer from OKB-1. Crews for the L1 must be named in order to complete the five-month training program in time. Eight L1's are being completed to the manned configuration, but Mishin believes it is necessary to plan for only six manned missions. It is decided to train nine crews. Spacecraft commanders will be Komarov, Bykovsky, Nikolayev, Gagarin, Leonov, Khrunov, Volynov, Beregovoi, and Shatalov. Flight engineers will be Yeliseyev, Kubasov, Makarov, Volkov, and Grechko. Komarov, Bykovsky or Nikolayev will command the first circumlunar flight. Mishin promises to name the OKB-1 candidates for that flight by 8 December. Mishin and Kerimov agree that training of cosmonaut- researchers from the Academy of Sciences may begin, although both Mishin and Rudenko expressed doubts about cosmonaut candidate Yershov. The failures of Cosmos 133 have been narrowed to entangled thrust vector vanes in the main engines and a single defective approach and orientation thruster. It is agreed to set the unmanned launch of Soyuz s/n 1 for 18 December as a final functional check of all systems. If this is successful, the date will then be set for the manned launch of Soyuz s/n 3 and 4. Flight control will be conducted from Yevpatoria. 1966 December 10 - . L1 production and flight plans - . Nation: Russia. Related Persons: Mishin, Smirnov, Ustinov. Program: Lunar L1. Flight: Soyuz 7K-L1 mission 1, Soyuz 7K-L1 mission 2, Soyuz 7K-L1 mission 3. Spacecraft Bus: Soyuz. Spacecraft: Soyuz 7K-L1. Mishin briefs the production plan for the L1 circumlunar spacecraft. Two spacecraft, s/n 1 and 2, have already been shipped to Tyuratam. These prototypes are not equipped with heat shields, and will be used to perfect orbital operation of the spacecraft without recovery of the capsule. L1 s/n 3 and 4 will be used for unmanned flights around the moon, with recovery on earth, in March to May 1967. The first manned flight around the moon is set for 25 June. All present, after examining the detailed production and training plans, object that they cannot be met. Mishin advises that Ustinov and Smirnov dictated the schedules and they are not subject to revision. Americans win the race to be first around the moon - . Nation: Russia. Related Persons: Bushuyev, Mishin, Tyulin, Vershinin. Program: Apollo, Lunar L1. Flight: Apollo 8, Soyuz 7K-L1 mission 1, Soyuz 7K-L1 mission 2, Soyuz 7K-L1 mission 3. The General Staff considers the impending Soyuz 4 and 5 flights. Vershinin asks - what is the likelihood of Apollo 8 being successful? Kamanin tells him it is very good now; the final midcourse correction was made successfully. A State Commission convenes to consider the Zond 6 failure. Mishin and Tyulin do not attend - they send Bushuyev to represent them. It has been found that 70 km from the cosmodrome, as the spacecraft deployed its parachute, the parachute lines were pyrotechnically severed at 3 km altitude and the capsule crashed into the plain. This in turn was found to be due to an ONA landing antenna failure; and this in turn caused by the SUS going down to temperatures of -5 deg C during the flight and the depressurisation of the cabin. The hydrogen peroxide, due to the low temperature, put the spcecraft at a 45 degree attitude instead of the 18 degree maximum (?). There are five L1's left. Number 13 is at Tyuratam begin prepared for an unmanned flight due for launch on 20 or 21 January, number 11 is being readied for a March 1969 manned launch, to be followed by numbers 14, 15, and 16 in April, May, June. At 19:15 the successful splashdown of Apollo 8 is reported. The race to be first around the moon is over. Soyuz 7K-L1 mission 2 (cancelled) - . Crew: Bykovsky, Rukavishnikov. Backup Crew: Klimuk. Nation: Russia. Program: Lunar L1. Flight: Soyuz 7K-L1 mission 2. Spacecraft Bus: Soyuz. Spacecraft: Soyuz 7K-L1. Planned second Soviet circumlunar flight. Cancelled after the success of the American Apollo 8..